In March, 2004, Hu Jie’s Looking for Lin Zhao’s Soul was fist shown in Zhongshan University, Guangzhou. Professor Ai Xiaoming, a feminist spokeswoman, wrote an article, “Lin Zhao gei women de jingshen tiaozhan Lin” (“Zhao’s Spiritual Challenge to Us”), in which she discusses both Lin Zhao and the filmmaker Hu Jie. This influential article circulated on the internet, and Hu Jie’s name suddenly became synonymous with “independent filmmaking” in China. 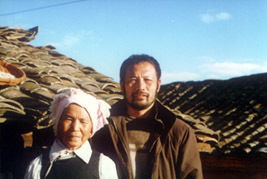 Hu Jie’s independent filmmaking is different from that of other independent filmmakers, especially documentary filmmakers, because Hu Jie consciously uses documentary film as a means to challenge official Chinese historical narratives while providing visual details in order to, in Hu Jie’s own words, “remember history”. In Looking for Lin Zhao’s Soul, the history that is ‘remembered’ is the Chinese Communist Party’s political persecution of intellectuals and Lin Zhao’s individual courage against the absolute totalitarianism of Mao’s China. 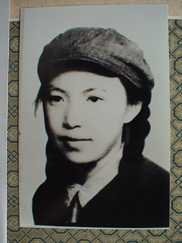 I first met Hu Jie at the “Conference on One Hundred Years of Feminist Thought in China” in Shanghai in June 2004. On 29 June 2004, we met again in Beijing. I was about to return to the US, and Hu Jie asked me to bring some gifts to his friends in America. It was during that meeting that the following interview was conducted. Before meeting him, I read a few articles on the internet about his films, but I had not yet seen any of them. In the following interview, I did not ask any specific questions regarding his films. I asked him to talk about his films and his reflections on these films. This interview is an introduction to his films in his own words. Hu Jie was born in 1958 and graduated from the Art College for the People’s Liberation Army, where he majored in oil painting. In 1995, he began to make documentaries. His films include Yuanmingyuan Artist Village (1995), Remote Mountains (1995), The Female Matchmaker (1996), On the Seaside (1999–2003), Mountain Songs in The Plain (2001–2003), Looking for Lin Zhao’s Soul (1999–2004), Bask in Sunshine (2002) and The Elected Village Chief (2000–2004). He also made a series of short films about migrant workers, including The Trash Collector (1998), The Janitors (1998), The Construction Workers (1998) and The Factory Set up by the Peasants (1998). Shen Rui: Would you like to introduce yourself and your documentary films first? Hu Jie: I began to make documentaries in 1995. My first documentary is about the Yuanmingyuan Artist Village where I was living at that time. The lifestyle of that artist community was very interesting and unique in China. Many artists lived in the same place, but each had their own style. No one imitated another. That kind of creativity was marvellous. In addition, Yuanmingyuan Artist Village also became a spotlight for attention from foreign countries, because many foreign newspapers reported on it and many foreigners were living there with Chinese artists. Cars from foreign embassies drove directly to the village. The Beijing municipal government felt that the situation in the artist village was out of control and decided to obliterate it from existence. The Beijing city municipal government first sent undercover policemen there to ask the landlords not to rent houses to artists. Then, the government asked artists to move out of the village. For those who were not willing to move out, their paintings were thrown out onto the streets and crushed by trucks. Therefore, many artists quickly fled the village. Before those events occurred, I was shooting a documentary film about the artists’ daily life, and during these events I recorded how the artists were driven out of Yuanmingyuan. This was my first documentary. After finishing the shooting, I did not edit it because I did not have an editing machine. I sketched a plan about how to edit it, how this scene could be after another scene, etc. I did not make it into a complete film, but gave the entire footage to a Japanese documentary filmmaker. I heard that he edited the film and showed it somewhere, but the footage is gone, and not in my hands anymore. I read from the internet that the film won some award, but I do not know anything about it. Now I do not have an inch of its footage. After making that first film, I used my sister’s camera and began to shoot my second film, Remote Mountains. HJ: In 1995. When I was studying oil painting at the Art College for the People’s Liberation Army, I went to the Qinlian Mountains in Qinghai Province to do sketches in a coal mining area. I know that place. I feel that those mine workers are like coming from hell. They only bathe once a year. They go into a shaft, work and sweat until they are soaked. When they come out of the shaft, they cannot shower at all because it is 3,500 meters above sea level and there is no water. It was difficult for me to breathe when I was there. Yet the workers dig out coal and carry it out. The condition is very primitive, and their labour is totally primitive. They even make the tools particularly for that kind of primitive working condition. After I began to make documentary films, I thought about them and thought that I would record and tell the coal miners’ lives and stories, so I went there. I think if a person studies oil painting, likes reading novels and loves to think about social and philosophical problems, he is able to make documentary films. That is how I thought of myself at that time. I went to the Qinlian Mountains, lived and ate with miners together, made friends with them, and recorded their labours and lives. At the beginning of shooting the film, I thought I would ask the authority of the mine to help, but they gave me a definite answer: “No Filming!” So I had no choice but to go “underground”, which means I hid myself among miners and shot the film. During the process, I was found and detained by the coal mine authorities. They fined me. I told them that I knew the mayor of the county, and they then let me go but asked me to leave right away. I left for a while but went back again and continued to shoot the film. By then I already had a composition in mind. I wanted to record their working lives and then follow them to their homes and record their family life. I wanted to show what they look like after they take a bath. The miners told me that they earned money to build a home, get married and support their children’s schooling. I wanted to record their lives in both places. However, one day, some miners suddenly ran toward me, telling me that the mine authority found me again and decided to get rid of me. Last time when I left, the authority shot guns and threatened to kill me. They did not shoot me directly but shot bullets above my head. I could feel and hear the sound of bullets. This time, the miners told me that the authority decided to get rid of me. They said, “Run, run away, run fast.” I listened to them, put the tapes I had filmed into a plastic bag, used some duct tape to seal it, carried my camera and other equipment, and hurriedly ran into the mountains. I hid at the top of a hill, watching to see if someone was following me. I finally saw a truck coming up along the road toward my direction. That was a long, steep road, so the truck was going up very slowly. The truck had a curtain at the rear, like a military truck. I ran to the road, waited for the truck silently and jumped into the truck from the rear when it passed by me. No one found me. I hid in the truck and left. Therefore, the finished film is now only a half of my composition. If I had not been found, if I could have stayed there longer, I could have followed the miners to their homes and finished the film. SR: How far are their homes from the mine? HJ: It is not that far, about 70 or 80 kilometres. Because I ran away from there in a rush, the finished film is not completed. Nonetheless, that is my second documentary film. After this film, I began to make The Female Matchmaker. It is a film about a matchmaker in the countryside. The filming took about three months. I went to the countryside and looked for female matchmakers. It is very interesting that I immediately found a dozen female matchmakers. SR: Which part of the countryside did you go? HJ: It is my relative’s hometown in Shandong Province. After I found the matchmakers, I got to know them and asked them if they would allow me to film them. I was also looking for an ideal matchmaker. I thought that the matchmaker must be pretty, vociferous and likable. Some matchmakers look like witches. That would not be right. Some are too young. That would not be good, either. In the end, I fortunately found one, who is in her sixties, very pretty, and good at talking. When she was young, she participated in the land reform, attacked landlords and became a director of local Women’s Association. However, because of some clan conflicts, she could not keep her position and became a matchmaker in the 1950s. She is quite old and has her own network of information. She knows every child, boys and girls from several dozen of the villages around. Unfortunately, I did not put the part that she worked for the CCP into the film. If I had a chance to reedit it, I would. I followed her for three months. During this period, I only left once. I got a skin infection because of fleas and bugs and had to go to the city to cure the infection. I bought a lot of insect killer and went back. I followed her as she did matchmaking and watched how she paired boys and girls into couples. During that process, one day a problem unexpectedly occurred. There was one couple, through her arrangement, already preparing to get married. However, for some reason the boy’s mother did not want to pay the matchmaker. The matchmaker was not happy and decided to break the couple up. That moment was very dramatic. After the girl heard the matchmaker’s words, the girl said if she could not get married she would commit suicide. At the same time, the boy’s mother in fact cleverly obtained two marriage licenses so that if this girl did not work out, the boy could still marry another girl. According to a Chinese saying, the boy’s mother “jiao ta liang zhi chuan” (“put her feet on two boats”). This kind of thing cannot happen in the city because it is a crime for dual marriage. However, in the countryside, it is ok. Under this circumstance, the matchmaker changed her mind, maybe because of my involvement with the affair. She said, “Okay, I will not take a cent from you and you both can get married as you please.” There is an issue here. That is, documentary filmmaking could affect the event you are recording. Even if I did not say a word and never showed my position, because of the camera, because of recording of the event, the event changes its course from a possible disaster into a happy ending. Meanwhile, because of my own view and position, I also neglected many things and did not record those things at that moment. Now, when I recall my experience there, I realize that I should have done more. For example, I did not touch upon the issue of women’s suicide in the countryside, although during the period I was there two women committed suicide. One woman heard that her husband did not want her and would divorce her. She felt that she lost face and could not live anymore. She just took her life. The other, after quarrelling with her husband, drank some pesticide and died. These kinds of things are so common there. In the countryside, the suicide rate for women is very high. SR: I read some articles saying that the suicide rate for women in China is the highest in the world. Everyday about 500 women commit suicide in China. HJ: Really? That really is a serious issue. However, when I was there I did not feel that women’s suicide was a part of my documentary film. I thought I went there to make a film about matchmakers, so I did not include any other things. Once a woman came up to me and told me her story. I was touched, but I was not sure if I should film her or not. So I did not do it. She told me that she married a few men in her life. It was not really marriage, because there was not any official procedure or ritual. After she lived with a man for months, the man would kick her out or beat her out. Then she lived with another man. So, she lived with so many men and did not know how many children she had given birth to. Now she was living with her youngest child. She said to me that if a woman did not have a man, she was not a human being. I was very shocked by her words. I do not understand why I was so shocked, maybe because I was just a good man. I did not have any woman’s consciousness. By the way, I learned a lot at that women’s conference (The Conference on One Hundred Years of Feminist Thought in China at Shanghai). Nowadays, when I reflect, I realize that because I did not have a woman’s consciousness, those good materials passed by me and I did not catch them. Because of my limitation of consciousness, I could not see how wonderful those materials would be at that time. I wished I had filmed those women and put these materials into the film. The film The Female Matchmaker would have had a deep and broad cultural and social context, which would help people understand why matchmaking exits even today. After making that film, I began to film migrant workers. During that period, I also attempted to make another film but I could not finish it because I could not continue shooting the film. That film is about a theatre troupe which performs traditional opera in rural areas. They go from village to village. When I was filming those actors’ lives, I saw that the troupe was controlled by a horrible clan/family system. The men in the troupe treated female actors with extreme cruelty. Female actors are beaten by men as many times as men please. Some female actors are beaten almost to death. I was shooting the film, but sometimes I could not do it because I could not bear to watch it. Many times I just went there to stop the beating. I could not believe the situation for those excellent female actors. They are so good on stage but, after they go home, their men beat them to death. After I finished half of the footage, I was going with the troupe to another village. The director of the troupe told me not to follow them. He pointed a finger at me, saying, “Get out of the bus. You can not follow us anymore.” I had no way but to get out of the bus. They drove away. Therefore I did not finish that film. Afterwards, I continued making films about migrant workers. I consciously made these short films because I thought peasants should not suffer that much. Peasants should have the same rights as we city people do, but our society designates them to the caste of peasant and make them suffer so much. I feel these short films are very good. But after I edited and finished the films, these films were just left there. SR: Did any television stations play them? HJ: No, not in China. By then I had some connection with a Japanese television station, and once in a while I would send some films to them as news. These newsreels are short, only a few minutes. Afterwards, I began to think about making some longer ones. I began to read and think about history. I believe that we should pay attention to historical events in China. I only had an idea and did not come up with any well-thought theory. With this idea, I started to make the documentary, Looking for Lin Zhao’s Soul. SR: How did you discover Lin Zhao? HJ: Actually I discovered her story by chance. One day a few friends and I were hanging out. One of them said his parents were Lin Zhao’s classmates. I asked who Lin Zhao was. He told me that Lin Zhao was a student at Beijing University in the 1950s. Because of some poems, she was arrested and put in gaol. In gaol she continued writing. She did not have any ink, so she wrote many things with her blood. In the end, she was executed. His words were simple but very shocking to me. I had never heard this kind of story: that one was arrested for writing poetry and killed for writing books with blood. I never thought that in Mao’s China there was this kind of people who would fight against the Communist Party, literally with blood. 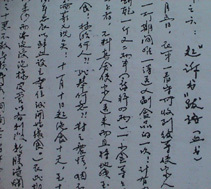 I thought that writing with blood could only write a few characters, but I was told that Lin Zhao wrote thousands and thousands characters with blood. This story was so shocking that I began to collect information and materials about Lin Zhao. I wanted to know her. By then I was working at the Centre for Pictures of Xinhua News Agency. I had worked there less than three years, shooting those short films about migrant workers. After I began to conduct research about Lin Zhao, one day my boss in Xinhua News Agency talked to me and told me that I could not work there anymore. He was very serious and said, “What you are doing, you know best. We do not want to know. You have two choices. One is to be fired from your job; the other is to resign by yourself.” I thought it would be terrible to be fired, so I chose to resign. They did not tell me why, but I know clearly: I was doing research on Lin Zhao. They also told me that they did like me very much because I was one of the major hands at the Centre, but they could not allow me to continue working there due to pressure from above. Who is above Xinhua News Agency? I understand that must be The Bureau of Public Safety. Hu Min [Hu Jie’s sister who was there with him during the interview]: You were under surveillance by undercover police during that time. HJ: It is odd to me because I was not yet making the film about Lin Zhao. I did not yet make any films to reflect the CCP’s problems. I was just making documentary films. Nevertheless, my resignation forced me to do what I really wanted to do and inspired me to make the film about Lin Zhao. If I did not resign, I had to work while making the film I want to make. Perhaps I would have never had time to do it. After I left the job, I thought, “All right, I will focus on making this film now.” I began to interview the people who knew Lin Zhao. SR: What do you think about this film? How significant is it for the Chinese people? HJ: I think that Looking for Lin Zhao’s Soul is the first documentary to record and reflect the historical periods of the anti-Rightist campaign and the Cultural Revolution in China. It is the first time that we Chinese used documentary films to reflect history. However, when I was making the film I did not think about this issue. Now I see the issue clearly. Indeed, there is a huge blank in Chinese history, such as the death by starvation for 40 million people from 1959–1962, the Cultural Revolution, and others, because in China there is neither discussion about these historical periods nor documentary films recording those historical events. Perhaps Wu Wenguang’s film, 1966: My Experience as a Red Guard (1993), is the only documentary film that touches upon these issues. During the period I was making the film about Lin Zhao, I also had chances to meet many kinds of people who lived in various conditions. Some lived in cities, and some in the countryside. In the countryside I also met other people around the people I interviewed. I met women who were sold by human traffickers to those places and began to pay attention to these women. That is the reason why I made Mountain Songs in the Plain. I met the girl when I was interviewing a person who knew Lin Zhao. I helped her and won her trust. Once she said to me, “You really do not look down upon us. We do not believe that you city folks could respect us, but you do. If you come next time, I would sing mountain songs for you.” When she said this to me, I did not think too much about it. After I left that place, I often thought about what she said. I knew she was a yi minority from Yunnan Province. She could sing songs – that was fascinating to me. I decided to go back to visit her. I told her, “Now I came back for you, please sing songs for me.” She started singing. Her songs were so beautiful. I thought it could be a very good documentary film, so I began to film her. At that time I still had a lot stereotypes in my mind: the official propaganda about women who were sold by human traffickers was still in my mind. I thought these women must be miserable and thought about how to save them from their misery. I was filming her from this angle at the beginning. However, while I was filming, I gradually found out that the reality was quite different. The men actually treated those women quite well. The girl, at the beginning, was averse to marriage, but soon accepted the situation. 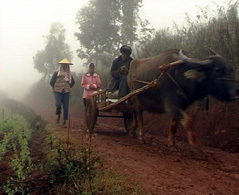 Later I followed her to go her home at Yunnan. I began to understand why she ran away from that place. Yunnan is a beautiful place with green mountains and clear rivers. We city people go there and would fall in love with the place at the first glimpse. But that place is extremely poor. The poverty is caused by social conditions. The forest is totally cleared out in that area. People have no way to make a living except selling drugs and guns, trafficking women, or using drugs. It is so poor that you would die if you did not get out of that place. Mountain Songs in the Plain is different from other films about the same topic because I have a different perspective and a different feeling about the issue. I understand the issue from many perspectives. Meanwhile, I also made the a few other films such as On the Seaside and The Elected Village Chief. The latter is a very interesting one. The village chief is a friend of mine. We became buddies in the army and have stayed in touch with each other since then. One day he phoned me, telling me that he would become the village chief and invited me to come over. I went to visit him and found out that he was just elected by villagers because the villagers disliked the branch secretary of the CCP in that village. That secretary was so corrupt that the villagers hoped the new chief could form a power base to go against him. The villagers also hoped that the new chief could expose the secretary’s economic crimes, such as bribery or putting public funds into his own pocket. I thought, “It must be dramatic to see how the new chief would be fighting against the old, corrupt one in the future.” I also doubted the possibility that the new chief would have any chance to win because that village, including the area around it, had just turned into an industrial development zone. I wondered how that huge economic opportunity could affect the new chief. No one knew what would happen at that time. I decided to film my friend, the new chief, and asked him his ideas, policy and philosophy in the first day of filming. He told me all his wonderful ideas. Four years later, this year, I asked him how he would evaluate himself. He just said, “I am a bad person now.” Four years ago, I wondered if he would also become corrupt through the course of fighting against the secretary. He was a good person, righteous and an idealist, but I was just wondering what would happen to him in the future four year ago. SR: Has the power corrupted him? HJ: Yes. Now he works with the secretary to get profit and make money for themselves. He did not keep his promises to the villagers. What he does now is deceive the villagers and make money and put the money in his own pocket. How did he make money? The method is quite simple. Because that area has become a development area, the village leases its land to the people who come here to set up businesses. The lease is for 50 years. For example, one mu (1/6 acre) is leased for 700 yuan per year. A 50 year lease costs 35,000 yuan. However, when they sign the lease or contract, the land owner only charges 500 hundred yuan per mu but asks the lessees to give the other 200 yuan to themselves as compensation. The lessees are ok with it because 700 yuan is extremely cheap for leasing that land. If they lease from other villages legally, they have to pay at least a thousand yuan. And also, they do not lease only one mu but hundreds of thousands of mu. How much money can the villager chief and the CCP branch secretary make by only doing that? From the perspective of economic reform, we can see how big this hole is in this process of reform. Pretty soon, the village chief makes a lot of money and the secretary has more money. That secretary is a veteran secretary of the CCP. He is also a model secretary. In order to become a model, you have to make millions and millions for the village. Can you image how much money he has made for himself? What a stunning profit it is for the village chief! What does he do with that much money? He has a hobby, that is, he likes to go to sing song bars. He invites many girls working in beauty parlours to go with him. You know the real business for these girls. His life has become decadent in ways like that. I recorded the four years of his life. SR: He is willing to be filmed? SR: He seems quite open. HJ: Yes, he is a very open and frank person. I think that documentary film is more direct and perceptive than painting. When you paint, you only can make things on canvas. If you are not creative, your paintings are like slogans and uninteresting. It is different when you make documentary films. Documentary film is direct and realistic. You can use it to reflect history or observe reality. Documentary film is direct. SR: Because most of your films have not been shown in Mainland China, what do you want to say to foreign audiences if your films are shown in other countries? HJ: This is a complicated question. My films were shown in Europe, but I believe most European audiences could not understand them. They would wonder how the Chinese people could suffer that much. How could the Chinese people’s lives be like that? So I feel that they would not understand. When I make a film, I do not consider what foreigners would think of the film. I want to make films for the Chinese. I want us to look at our own history and reality. I am afraid that foreigners would misunderstand my films and think lowly of us Chinese. I feel hesitant to show my films to foreign audiences, but I also hope they could see them. They could see how courageous we are, how strong we really are, and how much we love life, too. That is the spirit throughout all of my films. In documentary films you cannot say these words directly. You cannot use voice-over to tell an audience what you think, but you have to show them what you think. You cannot be too direct in a film. Otherwise, the film is not a piece of art anymore. It is easy for Chinese to recognize my feelings, I think; it would be hard for foreign audiences to understand. I believe in all my films I articulate this feeling: that is, our love for life, our fortitude and our longing for life, especially in harsh situations. That is the Chinese people! I want to say how wonderful we Chinese common people are! Our rulers must be kind to us a little bit. For example, how wonderful Lin Zhao was! She could sacrifice herself in order to make the system change for the better, in order to be good for others and benefit the public. I do not want to hold any flag against anyone, but I want to say that how the rulers treated the people in the past was wrong. The rulers murdered Lin Zhao, an ordinary intellectual. What they did was barbaric and wrong. This is my voice in the film – you can hear it throughout the film. Shen Rui is Visiting Assistant Professor, Depart of Asian Studies, Gettysburg College.